While Prabha Devi is drinking fancy cocktails (or more likely, Old Munk & 7up) under a palm somewhere in India, I'm stuck up north in what seems like an endless winter. I have no idea if you can tell by listening to this though. 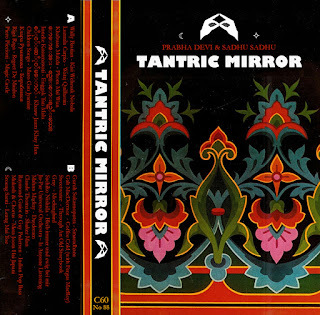 Tantric Mirror is a split where Prabha Devi did all of side B and I, obviously, did side A. Containing new and old favourites from us both. Well, they are all old... but you get it. Enjoy! Thank you very much! Love both sides and listening to Luzmila Carpio makes me joyful. Thank you so much Armand! We had fun making it. An absolute belter. Don't know what it is about this collection, but it seems to be in harmony with the wiring of my brain. I run a Psychiatric Unit, This has been played almost back to back for a couple of days now. Everyone appears in a better headspace. Hey Brin. Thanks so much for the comment although its perplexing as well as encouraging. You played our mix for patients? Thats awesome. Haha, anyway, whatever the situation, keep listening and we'll keep trying to bring the magic.